Many jobs require a degree (or even multiple degrees) but if you don’t have one, you can still earn a good living. Several modern jobs simply require you to have the necessary skills or a certificate. If you want to learn how to make money without a degree, you would be happy to hear that technological advances have changed the game. There are several opportunities being presented by online jobs, the sharing economy and survey sites. If you never had the opportunity to go to college or you just don’t think a full degree is for you, this article will present some jobs you can consider. We’ll look at part-time gigs and opportunities to earn extra cash before moving on to possible full-time jobs and freelance prospects. Click here for a lot of great ideas on how to make extra money! If you need to make some extra cash to help make ends meet, taking surveys may be just the thing for you. You can take a few hours out of your day to share your opinion on products and services that you use or are interested in and get rewarded for it. There are lots of survey sites but not all of them are genuine. If you’re looking for legitimate, high-quality surveys, consider Survey Junkie or Swagbucks. If you sign up for Survey Junkie, you earn virtual points you can redeem via Paypal or eGiftcards. Click here to sign up for Survey Junkie and start making extra money taking surveys! Another option is the popular Swagbucks. You can join over 20 million users in getting rewards for taking surveys and doing other routine online activities. Earn money for watching videos, searching on Yahoo and Google or watching videos. Earn a $5 bonus if you sign up for Swagbucks today. Swagbucks gives you rewards for things you will do online anyway. With InboxDollars, you can sign up to get daily emails with special offers you are likely to be interested in. If you read them, you get paid. Since you read emails every day anyway, this is an easy to way to earn some extra cash for doing so. The emails contain deals on products and services so you can also save some money. InboxDollars also rewards you for taking surveys, shopping online, playing games or watching videos. Click here to join InboxDollars and start earning money by completing different easy tasks online! Who doesn’t want to get back some money when they spend money? Whether you use an app or a cash back credit card, it’s an option you should consider. You can get cashback on purchases of everything from groceries to gas. Online stores, restaurants, and brick and mortar shops can all be sources of refunds. One good option is Ibotta, a free mobile coupon and cashback shopping app compatible with most iOS and Android devices. When you sign up with Ibotta, you have the opportunity to earn cash back on select products by performing easy tasks, purchasing the product then providing proof of purchase like a receipt. Click here to get a $10 sign-up bonus for Ibotta and start earning cash back on your purchases! Most people have things lying around the house which they haven’t used in years. Why not make money from them? Clothing, books, household items, and electronics are always in demand. You can go old school and organize a garage sale or use a modern solution like Decluttr. This site allows you to sell cell phones, tablets, CDs and DVDs, books, and games. You can even sell authentic Lego if it’s in good condition. Sign up for Decluttr now and start making money by getting rid of stuff you don’t need anymore. If you’re looking for ways to make money online without a degree, look no further than making products and selling them. The possibilities are practically endless so you may want to start by using your natural talents or interests. You can sell personalized cards, jewelry, décor items, handmade clothing, soap and lotions, preserves or anything else you can make. Display your items at markets, around your neighborhood or in an online marketplace like Etsy, Shopify or BigCartel. If you enjoy selling but don’t have any manufacturing skills, you can get involved in direct sales. Back in the day, you would have to go door-to-door but today, you can also market your products online. There are several companies that take on individuals who want to sell their products. The items span a range of categories including cosmetics and skincare, cleaning, weight loss, education, and more. Many companies offer a range of perks in addition to your commission including insurance plans and scholarships. Becoming an Avon rep is still attractive in 2019. Click here to learn about all the perks and begin making money. HealthyWage lets you achieve dual purposes: make some extra cash and get motivated to lose weight. You can make a personal bet or participate in a team weight loss challenge with your friends or another group. Start by inputting how much weight you want to lose, how long you think you will take to lose it, and how much money you want to bet each month. You also need to enter details of your height, weight and waist measurements and the site will tell you the amount you will win if you reach your goal. Afterwards, you can adjust your goals until you reach a prize amount that you are happy with. HealthyWage allows you to pay your bet amount either in full or installments. If you lose the weight you intended, you get to claim your prize. Start your fitness journey to get healthy and win money by signing up for your HealthyWage account today! Maybe you’re not interested in losing weight. What about saving more? Long Game Savings uses games and attractive rewards to encourage you to save. As you deposit money, you earn coins which can be used to play games. Your winnings include cash and cryptocurrency. During the process, you learn about crypto and blockchain technologies. To get started, you simply download the Long Game savings app and open a free FDIC-insured account. You then link this to your bank and make deposits on the schedule you set up. Download Long Game and get additional rewards when you save. If selling items or taking surveys doesn’t appeal to you, you may want to take advantage of the sharing economy. The sharing economy is expected to reach $335 billion by 2025 so if you haven’t cashed in yet, now is the time to do so. If you are at least 21 years old with a valid driver’s license that is at least a year old, you may be able to drive for Lyft. Your car will need to be in good condition, and it will undergo a 19-point inspection. It must be covered by insurance in your state. You will be required to undergo a background check. If you and your car pass all the assessments, you can begin picking up passengers on a part-time or full-time basis. Drivers are paid after every trip on a per minute or per mile basis. Click here to sign up for Lyft and start making money by helping others get to their destinations! If you’re an empty nester, why not earn some money from the rooms your children have left vacant? Depending on your location and the amenities you are willing and able to offer, you can make a good sum of money. While long-term rentals are an option, consider taking short-term bookings on sites like Airbnb, VRBO or booking.com. The regulations on the shared accommodation sector vary by state but you should be able to at least rent out a room for a portion of the year. Sign up to become an Airbnb host and start earning rental income on your property. Turo is like Airbnb for cars. If you don’t use your car much anymore, why not let it earn you some money? List your car on Turo and earn money as visitors skip the big rental agencies and turn to you. This is an easy way to make money without a degree. All you need is a car that’s in good condition but if it’s a unique make and model, it’ll be even more attractive. You get to set the minimum price for trips each day and choose a mileage limit. The renter will even return your car with fuel in the tank. Click here to sign up for Turo and make more money by renting out your vehicle. This money-making suggestion is perfect if you travel internationally. There are lots of people in your destination country who want someone to deliver items to them. As you may know, there are things you can purchase easily online from stores like Amazon, Walmart, and Apple that people can’t get in other countries. Grabr allows them to post delivery requests online. You can browse requests from your destination and choose which items you want to purchase and deliver. You get to choose how much you will charge for delivering the items. The next step is to confirm the size, quantity, or other details with the shopper. You then purchase the item with your own money so you know what you’re transporting across borders. When you deliver the product to the shopper in person, you will be reimbursed. You get your delivery fee and the money you spent on the item. Grabr will be more lucrative if you travel frequently but it can help you earn extra cash even if you only make a couple trips. As an added bonus, you get to meet locals along the way. Click this link for a lot of other amazing ways to earn extra money. If none of the above suggestions tickle your fancy, don’t worry. We have lots more ideas about how to make money without a degree. Online job marketplaces are a gold mine. Sites like Freelancer.com, PeoplePerHour, Fiverr and Upwork list thousands of jobs suitable for a wide range of skill sets. Depending on your level of experience and your talents, you can make a good living as a freelancer. There are many jobs that make money without a degree and you can find a lot of them online. Here are some of the things you can do. You can definitely make money without a degree by doing transcription work. As long as you can type quickly and accurately and pay attention to detail, you should be able to build up experience quickly. Journalists, motivational speakers, and lecturers often have interviews or speeches they need to get transcribed so you should get a steady flow of work. While you won’t need specialized knowledge for some jobs, you may need to know certain jargon for others. The legal and medical fields, for example, will require transcribers who understand common terms associated with those industries. Looking for proven tips and methods of earning passive income? Check out our recommendations! If you have an excellent command of the English language and you enjoy imparting knowledge to others, this may be for you. Teaching English online has become a popular way to either earn a full-time income or earn cash part-time from home or on the road. You can decide whether you want to work with children, college students, or business executives. Some companies require you to have a degree but not all do. Instead, they may require you to have native or near-native language skills and a Teaching English as a Foreign Language (TEFL) certificate. To gain your TEFL qualification, you typically need at least 100 hours of coursework and up to 20 hours of teaching practice. Visit this site to get started teaching English online! You can make a living without a degree if you know how to write well or edit copy. You may have realized we lived in a very content-driven world. Think about all the blogs, websites, social media pages and emails you come across on a daily basis. Someone has to write all that copy and that someone could be you. Many businesses outsource content creation to freelancers but if you’re looking for a full-time job, those are also often available. If you’re open to writing a range of content including sales copy, e-books, and landing pages, you won’t lack for earning opportunities. You may, however, have to learn many different style guides and writing styles if you take on multiple clients. While you won’t need a degree, you will need to have a variety of skills including search engine optimization and keyword research. If you have several years of writing experience, you can also apply for proofreading or simple editing jobs. You may need to take a copyediting course to ensure you know the tools of the trade for deeper edits or developmental editing. However, if you’re sitting on editing skills, look no further in your search for how to make money without a degree. All of the content writers are producing needs to be edited so if you do a good job, clients should keep returning. Creating and maintaining a blog can be a very lucrative opportunity. Click here to find out how we make over $30,000 a month blogging. Virtual assistants do a wide range of tasks so if you have strong digital and administrative skills, you can find employment. Many clients want someone to respond to emails, schedule social media posts, or respond to queries and comments. Others need appointments, interviews, or trips booked. However, some may also need help with accounting or bookkeeping, report preparation, or research. You can, therefore, choose the types of gigs which match your interests and qualifications. In many cases, you can work for clients anywhere around the world so your options are numerous. Do you enjoy customer service? You don’t need a degree to work in a call center. You just need to be an effective communicator who is organized, personable, and calm under pressure. Since you are the customer’s first point of contact with an organization, you need to be able to make a good first impression. You should be helpful, respectful, and knowledgeable. If you are a quick learner and you enjoy helping others, be on the lookout for vacancies for call center representatives. Click here for ideas on how to make money while working from home. Do you know your aperture from your shutter speed and how the two work together? If you have basic knowledge of photography, practice makes perfect. Brush up on your skills and begin offering your services professionally. You are unlikely to find anyone who cares whether you have a degree. Clients just want you to bring their concepts to life and portray them in the best light. You can choose from a wide range of niches including weddings, portraits, events, fashion, and product photography. You can even choose to focus on real estate or travel. The growing demand for content means photographers are in heavy demand. If you’re looking for more ways to make money with your photos, click here. A marketing or advertising degree would come in handy for this role but it isn’t mandatory. You just need to have the skills to generate a return on investment from digital marketing efforts. If you can prove you know how to increase sales, boost engagement, and achieve other business goals using social media, you can attract clients. Running your own successful website, online store, or membership site can go a long way in proving your abilities. Other skills like writing, graphic design, and photography can boost your social media marketing talents. Find out how to make money from affiliate marketing today. Do you love animals? Perhaps pet-sitting is the best new job for you. Many pet owners prefer to hire a sitter when they have to travel instead of taking their animal to a kennel. You would be responsible for feeding the pet, taking them for walks, and ensuring they get exercise and entertainment each day. Some owners will bring the animal to your home while others will ask you to stay at their place while they’re away. Check out sites like DogVacay and Rover for opportunities. 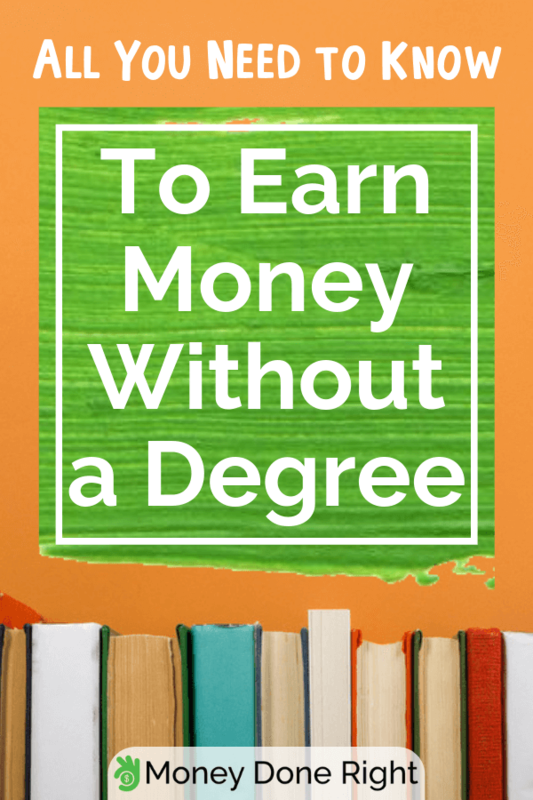 If you were wondering how to make money without a degree, this article proves there are several ways to do so. From taking surveys to taking part in the sharing economy or pet-sitting, you can make a living even without spending years in college. Combine some of the suggestions on this list to make it easier to reach your financial goals. For more ideas on how to earn passive income with minimum effort, check out this article. How easy has it been for you to make money without a degree? Which of these jobs are you most interested in? Let us know in the comments!